NWSL will break new ground on April 16 when the league kicks off its fourth season. 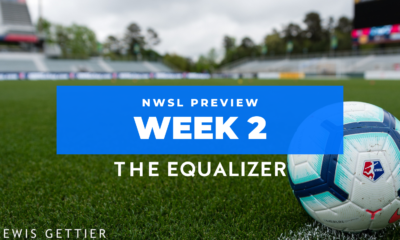 The NWSL schedule has been out for nearly two weeks so this might be a little bit late. At the same time the schedule hasn’t changed any and we are still more than a month away from any regular season matches taking place. So here are some things I like, and some things I don’t like about the 2016 schedule. This may sound corny, but it cannot be overstated. 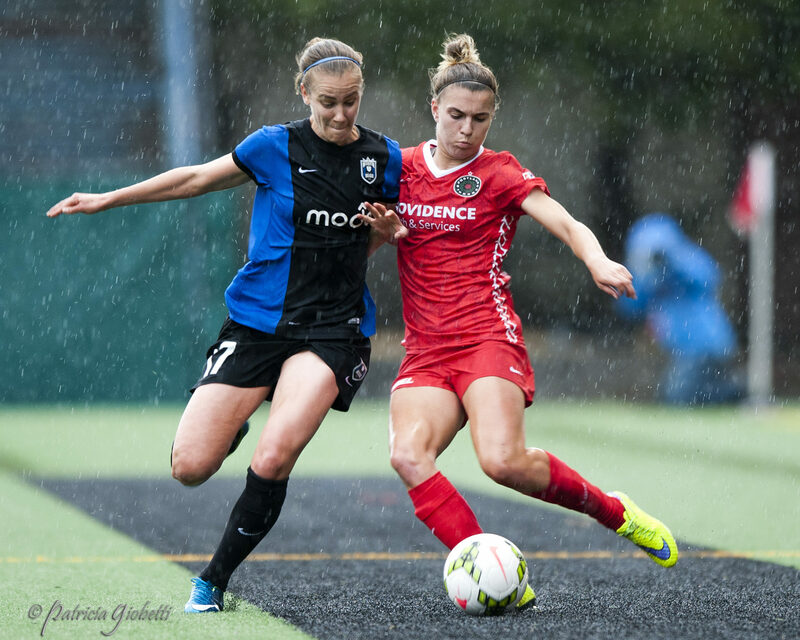 The fourth NWSL season is happening and that is a very big deal. Commissioner Jeff Plush alluded to it at the draft when he admitted that crossing the barrier set down by the WUSA and WPS and reaching a fourth season has quieted some of the questions about survival. The pre-Olympic portion of the season includes only two mid-week matches out of 74. The fixtures get a bit crowded after Rio in what is a calculated gamble by the league to pounce on any bump in attendance and other buzz created by the Olympics. Of 26 matches on the other side of the Olympic break, six of them are midweek including September 7-8 when all 10 teams are in action during a Wednesday-Thursday stretch. The gamble is that September means the start of school and maybe some cooler weather which could wipe out some of the Olympic bump. We also don’t have any historical precedent for how an Olympic tournament will affect the league. The other two leagues all came and went without playing in a Summer Olympic year. And while we know soccer fans will be glued to their sets, the Olympics is a massive smorgasbord of sports in which soccer often gets buried unlike the World Cup in which the sport transcends itself for a month. There isn’t even a men’s database to draw from because the men play the Olympics as a U-23 tournament. Still the layout of the schedule makes sense. Before Rio, the smallest window in which any team will play three times is when the Pride squeeze three into eight days from June 18-26. The only other close facsimile is the Thorns who play three between June 17 and 26. And since the Thorns are in Orlando on June 26 it mitigates any advantage for a rested team playing against a squad at the end of a lengthy run. Things get slightly dicier after the break. Every team will play labor Day weekend, then September 7-8, and then the following weekend. On the surface that seems fair for all. But the Breakers and Dash will enter the break with one fewer match played than everyone else. That will necessitate them playing an extra midweek match. That match, on August 31, matches up the two teams in Boston. The issue is that it means the Dash playing five times across 16 days and the Breakers doing it in 15. Not ideal, especially at the end of the season, but it is far less imbalance than we have seen in the first three seasons. In case you missed it, everyone will play everyone else twice and then five pairs of teams will play each other two extra times to fill out the remaining matches. Officially the reason is to save on travel costs and enhance rivalries. I wholeheartedly disagree on both counts. Yes, I get wanting to keep travel costs down, but if the Reign heading to Portland instead of Rochester is the difference in surviving that’s a bigger problem than not having the most balanced schedule possible. And other than the aforementioned Reign-Thorns and maybe just slightly the Midwest Melee between the Red Stars and FC Kansas City, I don’t see any of the other matchups being big enough rivalries to warrant extra matches. Furthermore playing extra matches does not enhance rivalries; it actually serves to dilute them. The best way to build rivalries organically and playing less often builds the anticipation. So I’m not buying that reasoning at all. Some team representatives have complained that loading up on certain opponents unfairly tips the balance of power toward the teams who get to play lesser sides four times. While that is true in the literal sense, it is one arguments I cannot accept. It may be more extreme but is really no different than 2013 and 2015 when the schedule was imbalanced. Those things tend to go in cycles anyway, but I am more critical of the format than I am of any competitive edge gained or lost based on matchups. And like one high-ranking person pointed out, it’s not like the schedule was ever going to be balanced with 10 teams playing 20 games. Competitive integrity is a work in progress like many other elements of NWSL. Given enough time, it will get there. But I don’t like the way this one was strategized. I said last year that the foray into September and an October 1 final was the point of no return in extending the schedule into the fall. This year we’re going even longer with the final weekend in September serving as the end of the regular season. And that means short of jamming the playoffs into a midweek-weekend format, the final will be even later than last year. I say this is good. The season needs to include more matches and it needs to last longer. Another benefit is having the September FIFA window on the weekend before the end of the regular season. Last year it cut through the heart of the playoffs and forced the teams playing in the NWSL Championship to go with more than two weeks between the end of the season and the final. I’m probably in the overwhelming minority here but I’m not a fan of Orlando opening in Portland or Washington being the opponent for Sky Blue’s home opener. My reasoning is that in theory, home openers should sell themselves and the buildup to anticipated matches should wait a bit. Now we all know the Thorns will draw a large number for their home opener even without Alex Morgan returning to the Rose City. And I doubt Jim Gabarra’s return to Yurcak Field will sell more than a handful or two of extra tickets. But in theory I prefer allowing for some time to get excited about such matchups. Sky Blue plays the Spirit—their four-play team—July 23 at Yurcak Field and then again seven days later in Washington. Later they host the Pride on September 7 and head to Orlando only three days later. In that case they are the only two times Sky Blue and the Pride will meet. My guess is that the schedule makers don’t like this much more than I do and that it happens just because of the complexities of putting it all together. But to me I’d rather not have teams see each other in consecutive matches. Like everything else, we’ll get there in time. April 24 is the day the Pride will christen the Citrus Bowl when they host the Houston Dash. Club president Phil Rawlins told a local radio station last month the club was closing in on 5,000 season tickets sold. That could make for quite a crowd to welcome the NWSL to Florida. May 7 featured four matches including Mark Parsons’s return trip to the Maryland SoccerPlex where he coached the Spirit for two-and-a-half seasons. 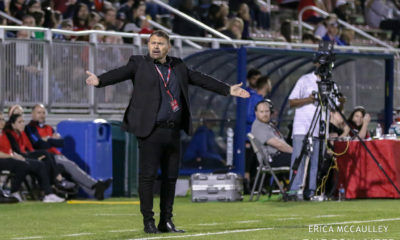 Parsons became the first coach in U.S. women’s soccer to make a club-to-club jump as an upgrade and he will be under much pressure as caretaker of a talented Thorns roster. In Washington he deserves credit for inheriting a fragile team that could have easily evolved as a club with a losing culture and getting the ship on the right track and into the playoffs two years in a row. There are four games scheduled on July 30. They will overlap but none have the same start time. Among them is the Midwest Melee with the Red Stars hosting Kansas City and the Pacific Northwest Derby in Portland. After one game the following day the league will go dark for 25 days in deference to the Olympics. August 26 features the return of NWSL action when the Spirit make their first trip to Orlando. 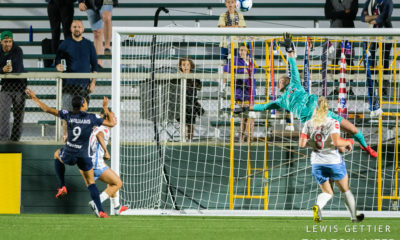 On the first game back from the 2015 World Cup, Thorns goalkeeper Michelle Betos scored the stoppage time equalizer against FC Kansas City. September 24 and 25 will be the final weekend of the regular season. Will playoff berths and the Shield be locked up or up for grabs? 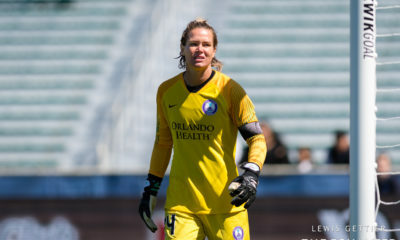 -A wave of retirements hit NWSL this week. FC Kansas City’s Liz Bogus and Meghan Lisenby plus the Red Stars’ Michelle Lomnicki all called it careers. Lomnicki was featured in a story I did last year about players who elected to keep chugging away despite infinitesimal wages and little to no hope at the national team. To me, NWSL is about players like Lomnicki (who was Michelle Wenino before marrying her husband Wes.) She began as a trialist in 2009 and stuck around long enough to become a pivotal depth player for a very good Red Stars team when they were hit by World Cup absences last summer. -Cat Whitehill is rejoining the Breakers as an assistant coach and club ambassador. -FC Kansas City still own the rights to Katrina Gorry, who played for the club in 2014 and for Australia at the World Cup. And I’m told that while nothing is close the door to Gorry’s return to Kansas City has not been closed. -Jeremiah Oshan of sounderatheart.com reported this week that the Reign have tripled season ticket sales from 2015. Oshan did not have exact numbers so it was unclear whether sales are tripled from a year ago or from where they ended the season. The Reign were disappointing at the gate last year until the World Cup but this news suggests numbers will be up in season four.